Nathan Wyburn posed with giant eye mascots The Protectors in Cardiff today (30 June), as a new survey reveals people in Wales expose their unprotected eyes to dangerous levels of UV light during the summer months. The Think About Your Eyes campaign found that Welsh people are exposing themselves to an average of 1 hour and 47 minutes of sunlight every day, seven times over the safe daily limit recommended by experts*, and damaging their vision despite over half (52%) knowing the dangers. 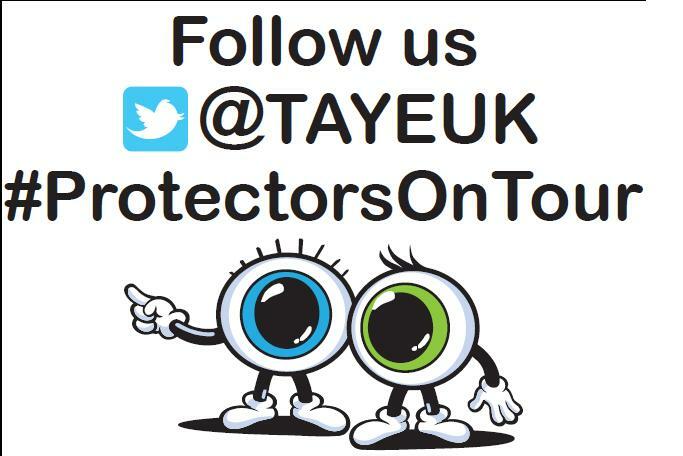 Giant eye mascots, “The Protectors”, are travelling around the country this summer as part of the Think About Your Eyes campaign’s awareness raising efforts. The Protectors were handing out information to city workers and shoppers in Cardiff throughout the morning. Local dispensing optician, Charlotte Magness from Medi-Optics in Thornhill Road, Llanishen shares her thoughts on the campaign. “People may not think that exposure to UV is a big problem in the UK but in July it takes just 15 minutes to exceed the UV exposure limit for one eight hour day. According to the met office today’s UV levels in Cardiff stand at [insert rating], which is considered high. Alongside Nathan, the Think About Your Eyes campaign is backed by independent opticians across the UK and the British Skin Foundation – which shares a mutual goal of raising awareness of the dangers of UV light. To find out more and check your personal UV exposure, visit the E-SPF UV Riskometer at: thinkaboutyoureyes.co.uk or pop into Medi-Optics to see Charlotte and her team at Thornhill Road, Llanishen and Maryport Road, Roath Park. – Invest in a wide-brimmed hat to reduce the UV ray exposure to the skin around your eyes & indeed your eyes. – Stay in the shade and try and avoid peak times for UV exposure – this is the middle of the morning and afternoon. – Discuss your UV exposure and risk with your local optician. Regular eye exams can help identify early eye damage and are extremely beneficial for your long-term eye and general health. Are we sun savvy enough?